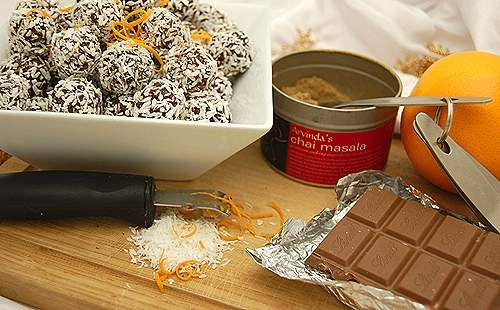 I usually make a big batch of these Chai Spiced Orange Chocolate Truffles and stash them in the freezer. I love these because they are indulgent but without any added sugars. I use medjool dates to sweeten the pot! These would be also nice to gift during the holidays or placed on your Christmas cookie plate. When you bite into one they are soft and melt-in-your-mouth. Store in the freezer for up to one month and they will hold their shape. 1) In a bowl, soak medjool dates in hot water for 30 minutes. Set aside. 2) In a double boiler over the stove, gently melt chocolate. (A double boiler is a pot of boiling water with a bowl placed on top to melt the chocolate. This way chocolate won’t burn). Stir in cream, vanilla extract, ARVINDA'S CHAI MASALA and orange zest. 3) In a food processor, purée dates with water until a smooth paste. In a separate big bowl combine date paste with chocolate mixture. Chill in freezer for 30 minutes. 4) Form into truffles and roll in coconut. Enjoy on a treat day! Arvinda’s Orange-Almond Chai Running Balls first appeared in the March/April 2010 issue of Canadian Running Magazine and later in their cookbook! They're perfect as a long-run power treat or as a post-workout recovery snack. Any workout exceeding one hour in length, requires fuel recovery — usually in the form of sugar or glucose. Many runners use gels or syrups as an easy digestible way to raise energy levels. This was something I never enjoyed as a long distance runner as it often gave me a case of nausea. Pure sugar, often with additives and preservatives, how healthy is that? I realized bringing my own homemade running treat was a tastier and healthier option. 1) In a medium-sized bowl, add almond butter and mix well. If consistency is stiff, warm up slightly in the microwave or on the stovetop. Add remaining ingredients and mix well. 2) Chill in refrigerator for 15–20 minutes. 3) Roll into balls slightly smaller than walnuts. Place remaining coconut in a small bowl. Dust with coconut to garnish. Store in the refrigerator. Yield = 40 pieces. These little power balls are perfect for a run, hike or post-workout treat. Now it’s time for a run. See you on the trails!